In short, I believe that through our five senses, our average brain can only interpret 7% of the data in everything that is happening around us, which means that at any given time, even right now, your brain cannot process 93% of the things in this moment, you cannot see, hear, smell, feel or taste that much of reality. Examples would be things you can't see but you know exist, like air, a virus or love - you know it's there because you have seen the effects of those things, but without assistance, like needing a microscope to investigate a virus up close, you won't see it or ever have a chance to study or understand it, and this is how the Oracle cards work, they are the microscope into the 93% of your life. Even if you were an Einstein who used more brain power than the average person, it would still be more than 90% unknown data that you as a human on this planet cannot simply comprehend. This is where The Oracles Cards come in... They are the mystics with an english/spiritual language dictionary which helps us translate messages from the same place where our creator, ancestors, spirit guides, angels and loved ones are. I like to call them "My Posse". Here they can communicate through the cards giving us a very condensed, human language version of what we need to hear to progress with the highest good of all without having to be a life long clairvoyant, audient or scentient. Obviously I highly recommend getting your own decks to personally work with them, but for loads of people it's just not their thing, so I am here to assist you adhoc, to sort through the tangled situations that may be brewing in your life, body, brain and/or soul. I like to take a practical approach on how to use the information to move forward rather than just have a reading of what may or may not happen, which is why I'm best described as a Soul Sister. 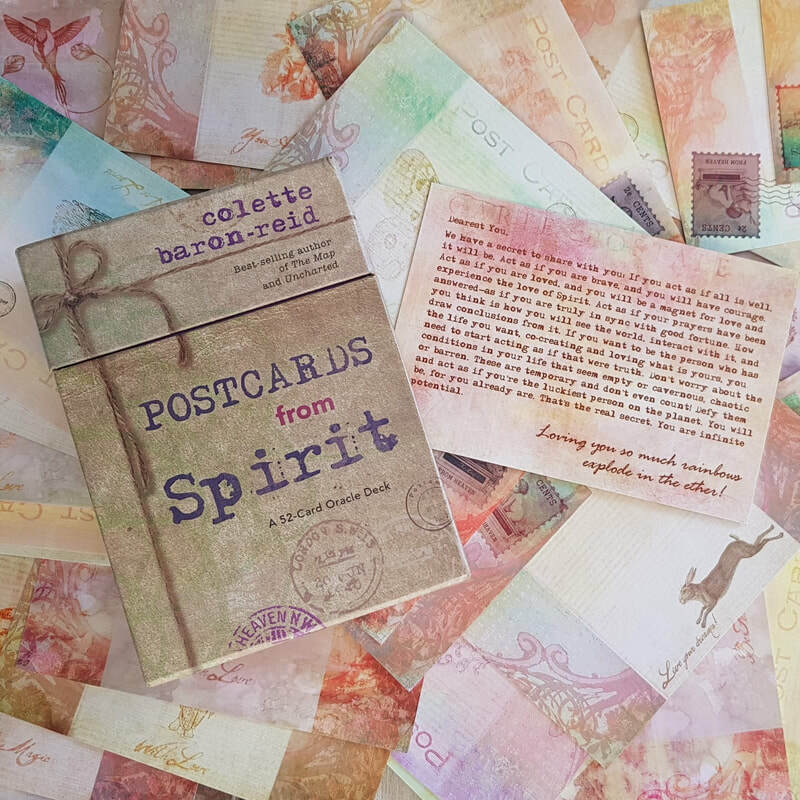 One of my favourite Gurus is Colette Baron-Reid, you can read all about her on her site and I really recommend following her if cards and spiritual self wellness is your thing. I don't charge a lot, because the cards are actually free online with Colette, so you can actually do your own reading everyday. She is the real deal healer, a benevolent spiritual leader who is trying to teach others to help themselves and you can only go right under her influence and it's easy because she does a lot of free classes and magickal workshops so that we can all gain access to the wisdom from the other side. Where I come in, is if you need help deciphering, which is why I only really do readings for my current clients, because we talk about all the "real" stuff... 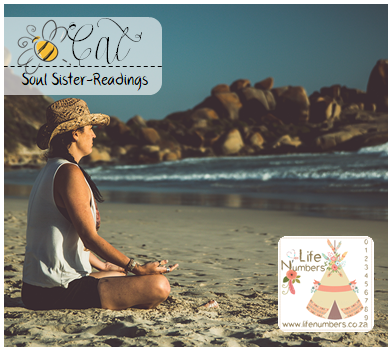 I am a Soul Sister, so I listen to where you are and I listen to what the cards say and we talk about it. I have been told that I am eloquent with love and understanding, void of judgement and that's because I believe that is how we make each other better and stronger. WhatsApp your deck option as well as your question (include a photo if I don't know you). I will attend to your reading at my next gap and send you a photo of your card as well what the book says. One card will not have much interaction as they are self explanatory however, I will assist to bridge the meanings with your puzzle pieces with 3 card readings and up. This deck has a psychic architecture that's simple and modern with the 4 suits being elements; Water (Cups), Air (Swords), Earth (Coins) and Fire (Wands) and the cards are read as archetypal aspects of the human experience that we may encounter within ourselves or out in the world. They are stunning little spiritual pick me uppers! Designed to illuminate any situation for the highest good of all. These cards are great for a daily motivation or to pick when looking for a sign on something. How to deal: Close your eyes. Take a deep slow breath in and out. Connecting the cards with your heart. Shuffle and focus on your question. Mix up the cards in front of you and select from anywhere in the pack that feels right. 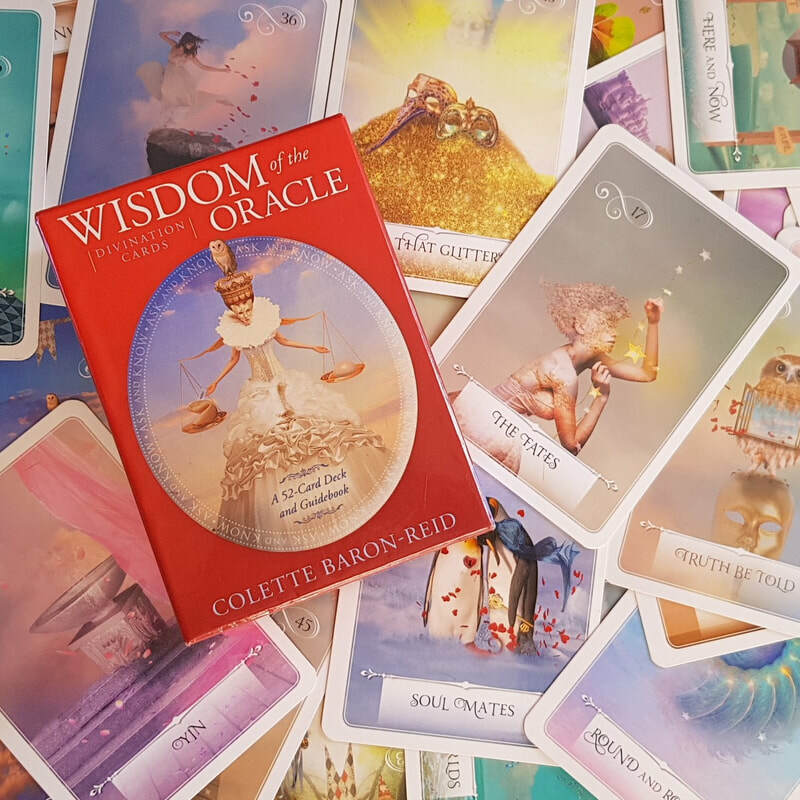 Greater intuitive awareness, self-mastery and the fulfillment of your deepest desires are only some of the wonderful gifts you can achieve from working with this deck. ​This reading will reveal the present situation, the action needed to progress and the potential direction for the future. Designed to see the map of what you are asking about. My recent past. My current vantage point? What am I resisting? Where is my unexpected assistance coming from? My next right step? Possible outcome? 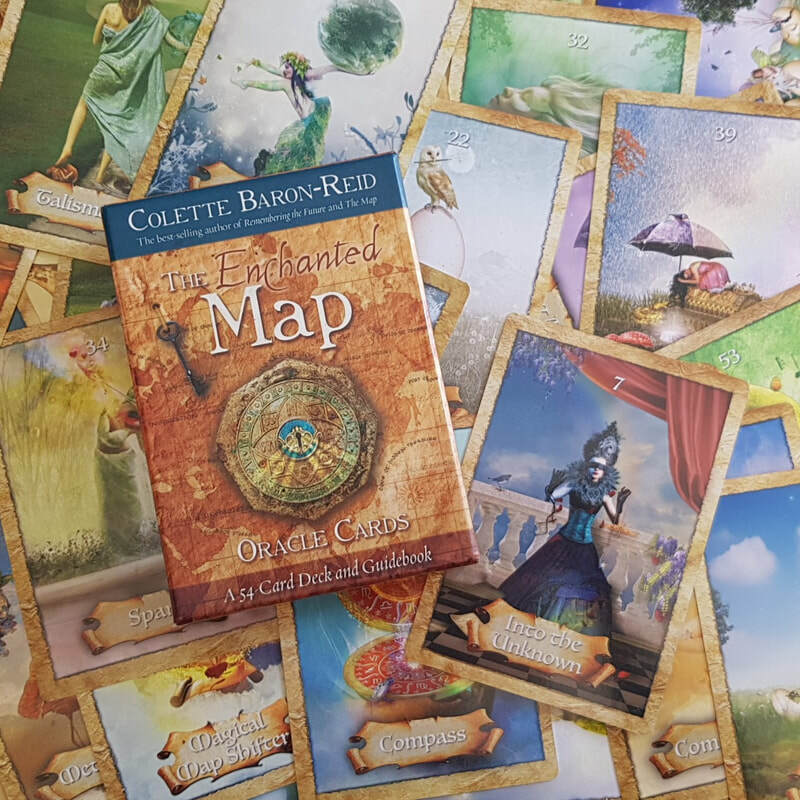 A truly fabulous reading to get an areal view of your situation/question and hopefully get your compass headed True North again, navigating you through your life map. How to deal: Close your eyes. Take a deep slow breath in and out. Connecting the cards with your heart. Shuffle and focus on your question. For one card: mix up the cards in front of you and select from anywhere in the pack that feels right. For six card: Cut deck into 3. Client chooses a pack of cards and you deal from the top into the correct positions. These cards respond to you with "We" and it's just so fitting and lovely because we do have a whole Posse on the other side singing their praises at you. So you could ask a specific someone a question or you could just say, you miss them and you wish you could hear what they have to say right now. I love this deck because it gave a voice to my kitty who I lost to old age in 2016, which introduced me to this pack and then it opened the door to hearing all my other loved ones who I was missing and wanted to hear from. It really is a special deck when you are needing to hear that special message from the other side, whether you are addressing your creator, your angels, guides, someone crossed over or someone alive that you can't have contact with any longer, no matter who you need to hear from, you'll get some love or comfort from these. This deck will assist in bridging the gap between this world and all the other realms and grant you entrance into a magickal dialogue with the Divine to increase your awareness, self mastery and fulfillment of your highest purpose. A lovely deck to bless your path and celebrate your highest good. How to deal: Close your eyes. Take a deep slow breath in and out. Connecting the cards with your heart. Shuffle and focus on your question. Cut deck into 3 and mix together in front of you and then select from anywhere in the pack that feels right. This reading will address these questions: Where have you been? Where am I now? Where is this leading me? With a fourth card for clarification on the whole situation. 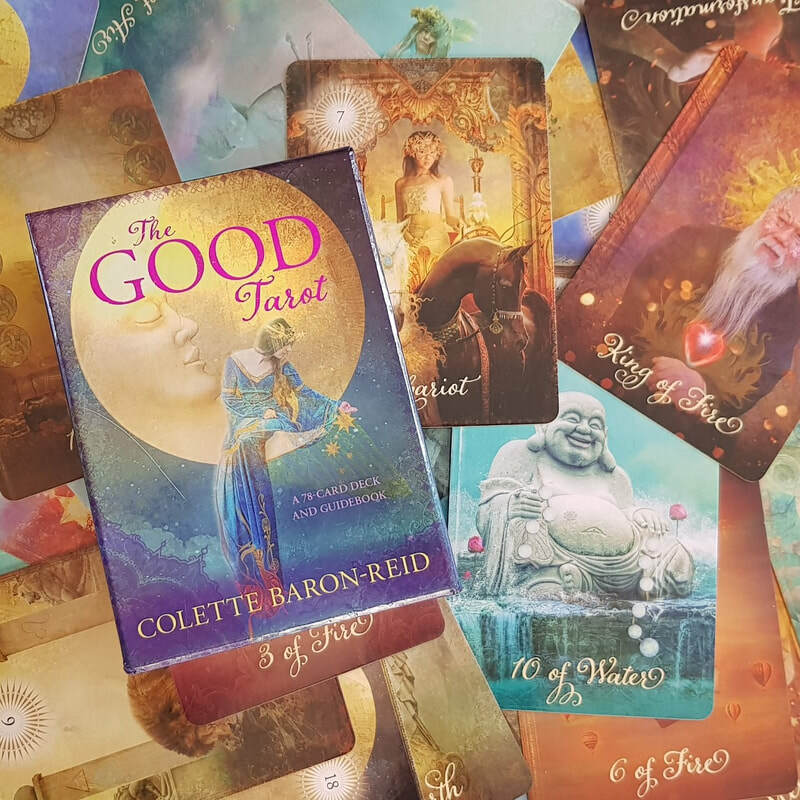 This deck brings you a channeled message from each Goddess, giving you a little bit of history on Her as well as positively reflecting a powerful love that the Goddess naturally brings to us. The whole deck is a mixture of different religions, cultures and spirituality. Designed to show you which Goddess energy is around you, reflecting their particular nurturing style with you, awakening your awareness and can really help giving you a new monthly task to focus on with your self mastery and balancing your feminine energies in this crazy busy world. Possible questions are: Which Goddess is with me? Which Goddess is best to work with in this situation? How is the best way to handle this? How to deal: Close your eyes. Take a deep slow breath in and out. Connecting the cards with your heart. Shuffle and focus on your question or the Goddess. Mix up the cards in front of you and select from anywhere in the pack that feels right. 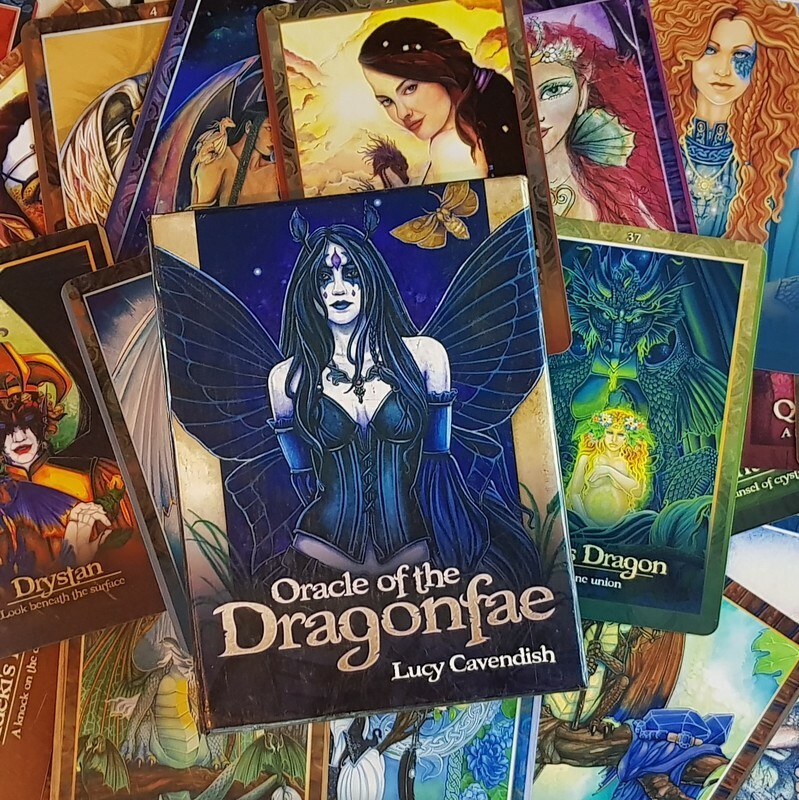 Introducing you to the mystery and wisdom of the Dragonfae, how to work with them, gaining clarity and claiming your power back to heal yourself and the planet. This deck has a dimensional portal to the Dragonfae realm with messages of love, healing and protection for the highest good of all. Designed to illuminate any situation for the highest good of all. These cards are great for a daily motivation or to pick when looking for a sign on something. If you are feeling lost and need to see whose actually supporting you on the other side, this can change everyday depending on your energies. This reading will reveal the past, present and future of the situation you want to know about. Designed to show the truth of our cycles of existence and can even be worked with the medicine wheel for timing. It will address the following: Where am I now? How do I move forward? What are my obstacles? Where do I need to let go and how? What is my wisdom? Who are my loved ones? How can I open up to my abundance? Mother Nature's message to me? How do I keep going? My arrival? My Destiny, why & how? How to deal: Close your eyes. Take a deep slow breath in and out. Connecting the cards with your heart. Shuffle and focus on your question. Mix up the cards in front of you and select from anywhere in the pack that feels right. 11Card spread anticlockwise (widdershins). 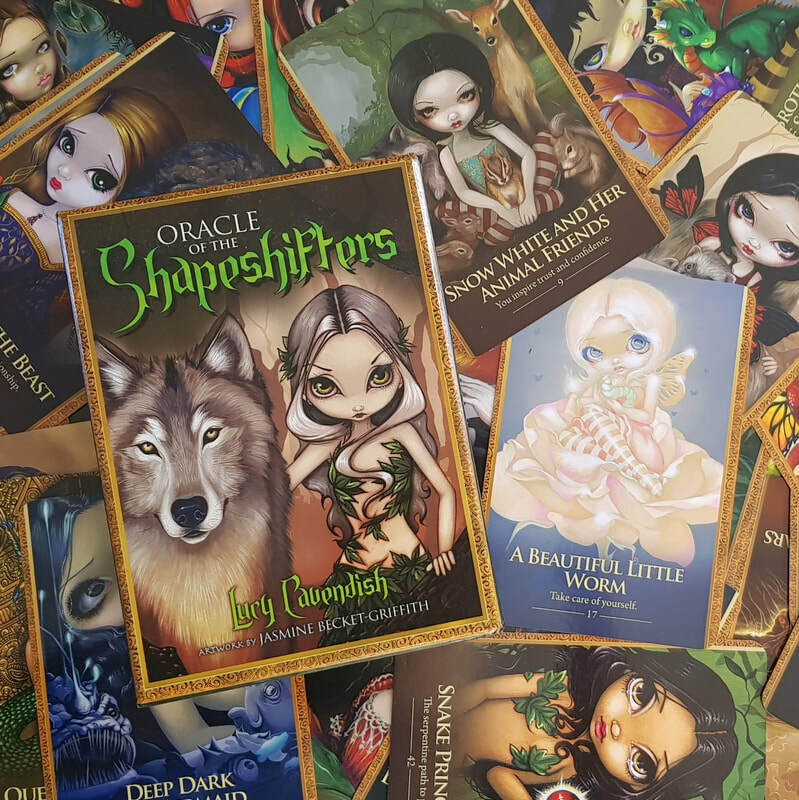 Within this deck are magickal messages from familiars, companions, shamans, witches, wizards, wise ones and more with hidden knowledge, shape shifting, camouflaging, change, invisibility and metamorphosis, ready to share it with you during times of transition. They will teach, inspire, develop you and adapt you to not only survive, but to thrive with accomplishment and satisfaction to become an advocate for the wild world, unbinding fear, igniting courage and inspire a relationship with the instinctual. Centre: Now and the Self. East/Air: Intellectual, mind and what is needed. Fire/South: Passion, intention and illuminate what is lacking. Water/West: Emotions, psyche and how to work with them. Earth/North: The body, manifesting, abundance, health and transformation with what action to take. How to deal: Close your eyes. Take a deep slow breath in and out. Connecting the cards with your heart. Shuffle and focus on your question. Fan them out in front of you and select the cards that feel right. 11Card spread anticlockwise (widdershins). This spread should no doubt lead you to your familiar, your creature companion who wants to teach and protect you. The reading will illuminate: Your instinct, true nature and unsocialised self. Your guide and driving reasons who protects, watches and encourages your talents. Your heart, vulnerability, passions, attractions, desires and mysteries. Familiars have existed since before time began to remind us who we are and build the connection to our creator. This journey will take you back to your true self, bringing feelings of belonging and wholeness by answering questions such as: Who am I now? What will I learn next? Challenge and how to work with it? What must die so that the rest of me can live? What is my soul wisdom? Who loves me, who are my friends and allies? Where will my abundance come from? What do the shapesifters wish me to do? What to do to keep going? Where will I be when I arrive and how will it feel? Destiny and the purpose of my soul at this time? A few of the readings have reverse, upside down or protection meanings. I have never been able to read them so once sided no matter who the author has been or what the situation has been. I believe that we are all a balance of light/dark, good/bad, empath/narc, positive/negative, healthy/sick and so we are always experiencing both sides of the same coin in one way or another all day, every day. I like my clients to read every word, as Colette explains in all her classes, she herself reads out her writings because our perceptions are so different and one word may mean nothing to me, but be a light bulb word for you and after all, that is where things get lost... in the translation, so always read all the words of the pages and more than once to really let it sink in. When reading the pages that go with the cards, take in all aspects of it where it applies to your current situation and understand that you will most likely bounce between the different readings for the card depending on how you are feeling from moment to moment and it can change, so I believe it's best to keep your options open. Keep a diary/journal with all your workings so you can note down the feelings, thoughts and inspirations that come to you as you work with the cards. Lucy Cavendish works her magick every day here and in the celestial and elemental realms, embracing the creed of personal fulfillment and happiness with a belief system that sees us a part of nature, giving is all the motivation to respect, revere and delight in our unique experience on Planet Earth. 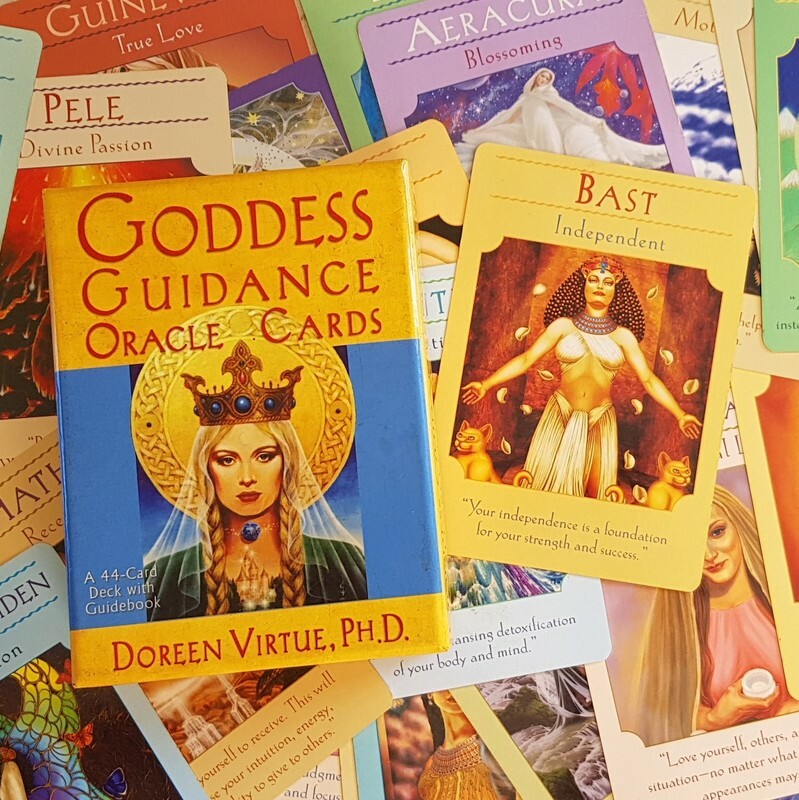 You can find out more about Doreen Virtue and her journey by visiting her website. She has a mixture of decks including angels and saints as well. 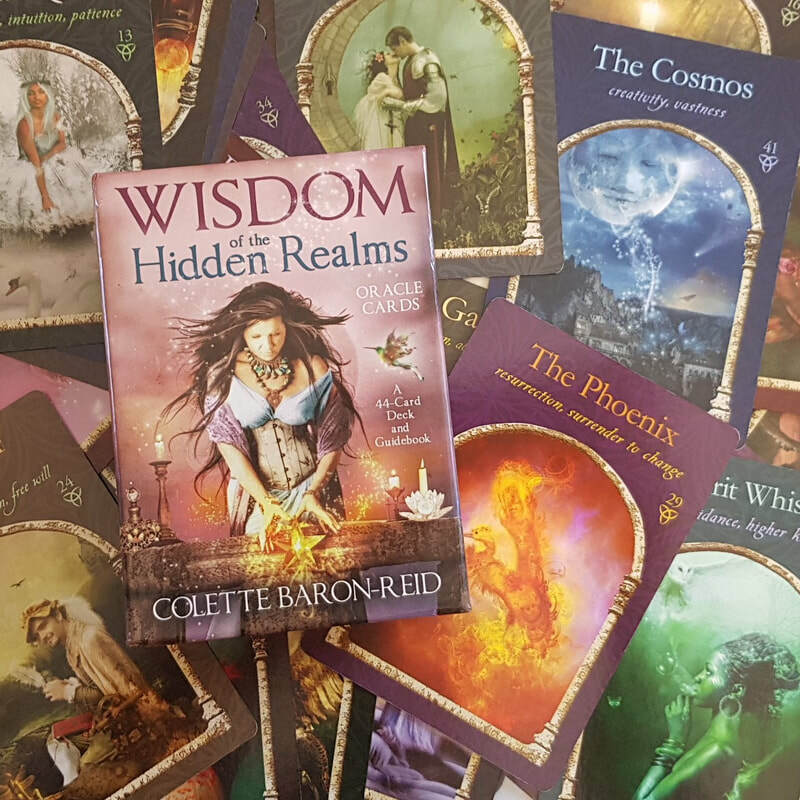 Please click through to Colette's website to choose your own cards - she has three of her magnificent decks online as well as smart phone apps. Definitely check out her new fabulous Mystical Shaman Oracle where you can also choose cards daily. Mine is on it's way and I will load them as soon as I have built a relationship up with them, very exciting! Go look for yourself! What do I need to know about x? ​What is the next right action to take regarding x? What is possible next regarding this situation? ​What do I need to know about my relationship? ​What is the evolving nature of this situation? What wisdom can I learn about my career? ​Where am I heading regarding x? What do I need to learn regarding x? What will be the result if I take this action? If I take action what will the result be? How will this situation progress? What can I expect from x?